NEW! Valentina E. Valentine Ensemble @ UBER! 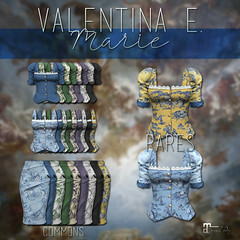 Out now at UBER our new Valentina E. Valentine Ensemble featuring three blouse texture options. Belleza, Maitreya, & Slink sizes included. NEW! Valentina E. Villanelle Dress @ UBER! Out now at UBER our new Valentina E. Villanelle Dress! Inspired by the iconic pink dress from Killing Eve, this semi sheer dress works perfectly with the Maitreya Body Lingerie or your own favourite pieces! Available in six color options, exclusively for Maitreya Lara. NEW! Valentina E. Holly Ensemble @ UBER! Out now at UBER our new Valentina E. Holly Overcoat & Sweater and Contrast Joggers! The Overcoat & Sweater includes a HUD with 12 texture options. There are also three stripe options with the Contrast Joggers. Available in Tweed & Plaid wool coat finishes, exclusively for Maitreya Lara. NEW! Valentina E. Sloane Ensemble @ UBER! NEW! Valentina E. Maisie Ensemble @ UBER! Out now at UBER our new Valentina E. Maisie Tied Shirt and Skirt! Available in a variety of colors, exclusively for Maitreya Lara. NEW! Valentina E. Lovely Satin Ensemble @ Uber! 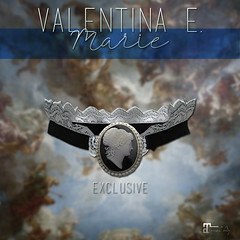 Out now at Uber, our new Valentina E. Lovely Satin Ensemble! This elegant biker inspired outfit features loads of details including snaps, zips, belts, and beautiful texturing. Available in four color options exclusively for Maitreya Lara. Demos available at our Main Location and at the Uber event. We hope you like it!